Canvas is a collection of small QML examples relating to the Canvas type. Each example is a small QML file emphasizing a particular type or feature. 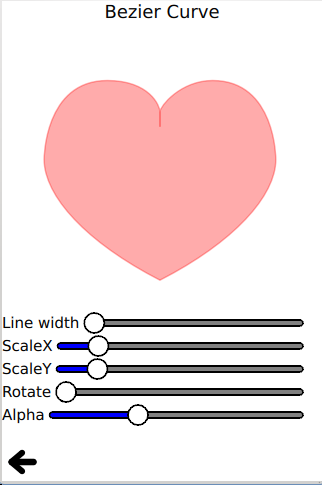 Red heart uses the bezier curve API to stroke and fill a red heart. Squircle uses a collection of simple moveTo() and lineTo() path APIs to draw a smooth squircle. Rounded rectangle uses a collection of lineTo() and arcTo() path APIs to draw a rounded rectangle. Smile face uses several paths to draw and fill a smiling face. Clip uses the clip API to clip a given image. Tiger uses the SVG path API to draw a tiger with a collection of SVG path strings.